There are many famous people who have used wheelchairs. They each have left a profound impact in their respective fields despite their disabilities. 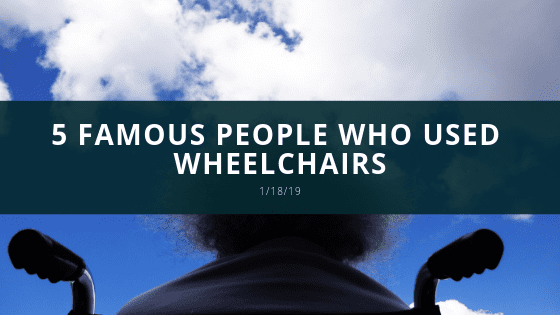 Here are 5 famous people who used wheelchairs. This renowned Physicist had a huge impact on quantum theory and gravitational physics. One of his most notable pieces of work was his book, A Brief History of Time. His work with black holes led him to find that they emit radiation. At 21, Stephen Hawking was diagnosed with ALS and was told he would only live for 2 years. However, he lived well into his 70s. Hawking was paralyzed from head to toe for over 30 years. But, with the use of a voice synthesizer, he was able to communicate. The 32nd President was the only President to have been elected to 4 terms from 1933 to 1945. During the summer of 1921, he contracted an illness believed to be polio while vacationing with his family at Campobello Island. Roosevelt was paralyzed from the waist down. However, he tried a wide range of therapies to regain control of his legs, including hydrotherapy. He was able to walk a short distance with iron braces and a cane. While in public Roosevelt never used his wheelchair. It is believed that he would go to great lengths to keep this sight of him from the American public. This could be due to the current sentiment to those with disabilities at the time. Most known for his role as Superman, Christopher Reeve was an actor, director, writer, producer, and activist. With 47 acting credits, Reeve left a lasting impact on cinema and television still remembered to this day. Following an equestrian accident, Reeve was left paralyzed from and confined to a wheelchair. However, this did not hinder Reeves. He lobbied for people with spinal cord injuries and the research of stem cells. He founded the Christopher Reeve Foundation and co-founded the Reeve-Irvine Research Center. Mexican Surrealist painter Frida Kahlo was most known for her striking and colorful self-portraits. When she was 18, Kahlo was involved in a bus accident that left her severe physical issues for the remainder of her life. Much of her work showcased the pain she endured from this accident. Her work continues to be renowned to this day. Known as Frida-mania, her life and imagery speak volumes of gender, sexuality, and race. Former Texas congresswoman was the first black woman elected to the Texas State Senate and the first black Texan in Congress. Jordan suffered from multiple sclerosis was wheelchair bound. However, she remained private about her illnesses. In 1994 she was awarded the Presidential Medal of Freedom.